a rocket firebox, exhausting at the other end (right) at the bottom. The stove was built, dried out, and data was collected over a 6.5 hour burn of 70 lbs of wood. and data collection from first test burn within a 3 day schedule. 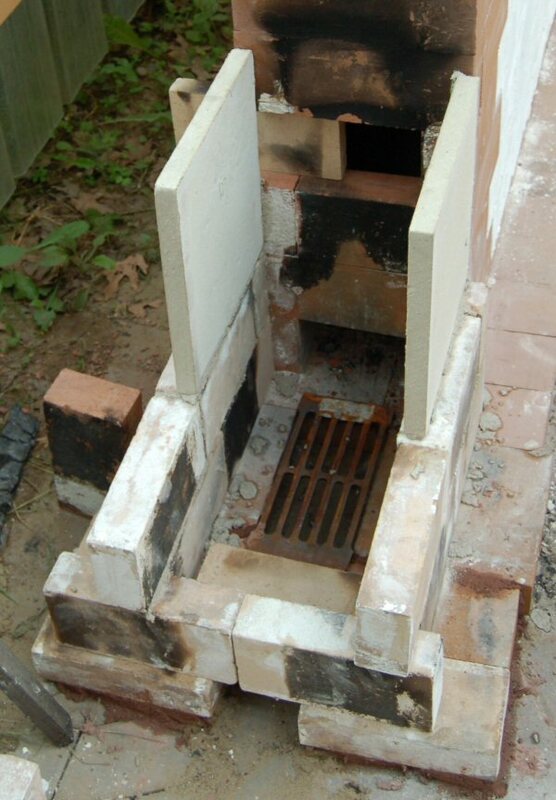 The bell footprint was laid with a 6.75" deep chamber, to allow for no cuts and a 9" firebrick cap. Bell is 92" wide and 77" high on the outside. About 450 firebricks went up in 1 day with 2 masons, including prep, layout, etc. Ceiling is a 2.5" firebrick cap. skim coated with lime putty. Chimney connection at rear side. 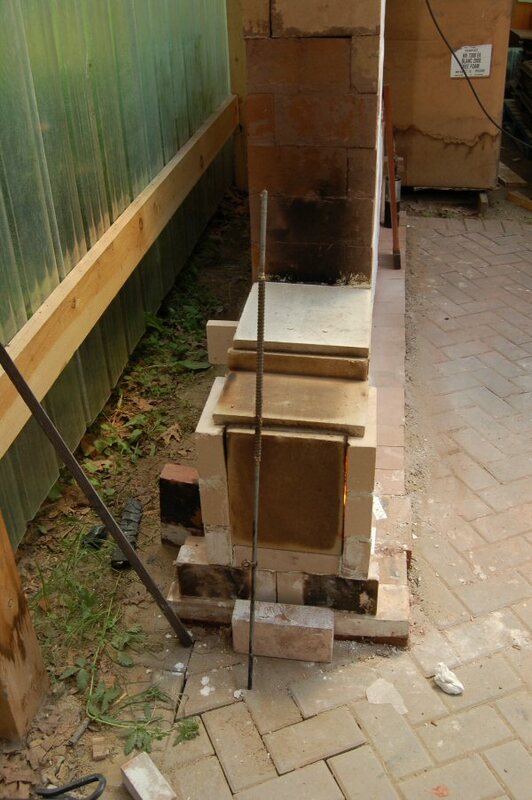 Draft was not easy to establish, and required chimney priming with a torch. Weather was wet and very variable. Burning scrap to dry out the bricks. A 6.5 hour burn was conducted the next day, using Beech wood at 17% moisture. A total of 70 lbs of wood was burned for the actual test. Gas probe inserted into chimney. At the rear of the probe is a quick change ceramic particulate filter that cleans the gas for analysis. Testo 330-2 gas analyzer has many useful features. It is self-calibrating, and has a USB connection that allows automated control via software on the laptop. Setup on the rocket stove was about 5 minutes. A 12 point grid was marked out and measured every 10 minutes for the first 4 hours, and every 30 minutes after that. Excel spreadsheet with temperature data. Hypothesis of gas flow, based on surface temperatures. 5 and 8 are the coldest spots. fueling rate was around 10 lbs/hr., which seems close to maximum capacity. An estimated filter catch is plugged in, so that efficiency and CO can be calculated. This shows the 6.5" x 4.5" opening from the firebox into the bell. A piece of refractory insulating board, 6.5" x 12", is added 6" back from the opening. The previous 6.5" x 4.5" opening was then restored. Fire started easily. Later, draft was hard to establish and maintain, due to extremely low stack temperatures. In contrast, the first burn had very high stack temperatures. Whisps of steam exiting the chimney, slowly. Little or no actual smoke. An operating error with the gas analyzer resulted in loss of gas data. Very, very different from the first burn. Time constraints only allowed a 2:15 hour test, during which 23 pounds of wood were added. Note that the hottest previous spots were now the coldest. This demonstrates the excellent heat exchange ability of even a single bell, without channels. The previous configuration was modified, with the insulating board moved 6" further downstream, or 12"
several times. See flue temperature graph, below. The burn was abandoned. The spikes represent when a torch was inserted into the chimney flue. No gas analysis info available do to an error operating the analyzer. Resolved on July 16. Firebox changes will be tried, next. 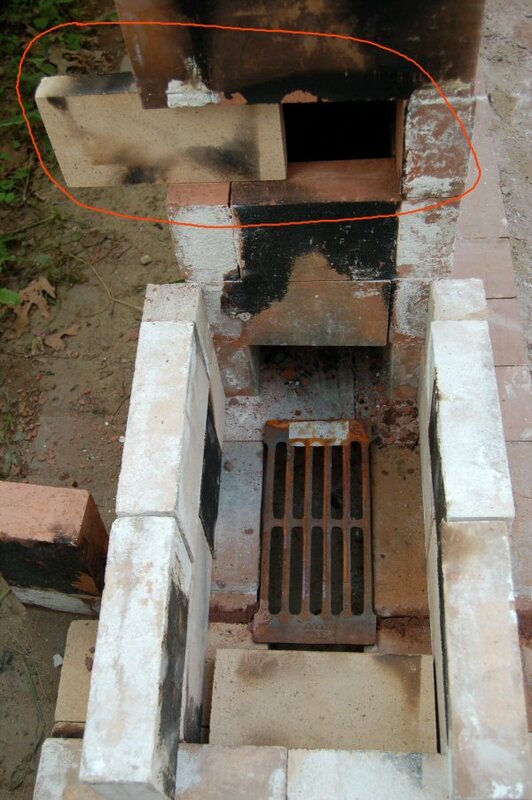 Firebox was rebuilt with an underfire grate and a bypass damper for startup. High temperature insulating board was used for a quick build. Firebrick at bottom controls the air. The crack tapered off on either side. Left side shown. Firebox was rebuilt to take 16" horizontal wood, with a top lid. Grate at bottom. Note bypass damper on right, open about 1/2". 3.75 lbs of kindling were laid on top of the grate. The firebox was filled to the top with maple, roughly 3 lb pieces. Total weight of fuel charge was 30 lbs. Firebox was capped off with insulating board. Fire was lit with torch (shown above) from below. Very smoky start. Chimney required boost with torch, and then fire took off. CO is very high, also smoke. Note the dramatic change at 63 minutes, when the lid was opened and the wood load was poked. Stack temperature goes up, oxygen goes down, CO drops drastically, fire stops smoking, efficiency is up. Testo data in Excel format. Raw data. Lid was opened at 63 minutes. Fire was smokey, too much space at bottom of pile, around grate. Wood was poked. See dramatic change in gas curve, above. Lid was opened near the end, at 95 minutes, for a second poke, and fuel was rearranged on grate. See gas curves. Note the high CO loss of 7.2%. Particulates is an estimate from an assumed filter weight, no measurement was made. The horizontal crack had closed, and was still almost closed at 1 hour (above). It opened up a bit, after that. The grate was moved towards the front. The July 19 burn was repeated with the same wood load, 30 lbs. Instead of being lit as a batch load, a kindling fire was started, and fuel was added in stages. Fuel load. 0.7 lbs of kindling on the top right. 30 lbs total. Previous (July 19) burn used 3.75 lbs kindling, stacked underneath the main load. Fire was started, lid was put on, and chimney was boosted with a torch for 2 minutes. 10 lbs of wood had been added by this time. Firebox started to leak, with some spillage, midway through the burn. CO was the highest ever recorded at Lopez Labs. Fuel would be added, CO would spike. However, note the 20% CO loss. This means that 20% of the energy in the fuel left the stack as unburned CO. So much for underfire air. rocket stove with a heat riser. This would be the standard rocket configuration, and has not been tested yet. Front was opened in order to add a heat riser tube. View down the bell. There is an even 3/8" layer of flyash all the way along. "California Bridge" to back up the riser panels. Three 12" pieces of insulating board, for a total riser height of 36". than with with previous setup. An extra course was added during the burn, so that a lid could be put on to control the air. Much easier to start with the riser tube. Super low stack temperature, incredibly low CO for the middle third of the burn. Very high efficiency. In the photo above, that is not smoke coming from the chimney. It is steam. This photo was taken during the cleanest portion of the burn. Steam was wafting out slowly. There was not quite enough draft, due to the low stack temperature. Note the flames coming out the top. Wood is poking out, because of charcoal buildup at bottom of firebox. A taller riser tube would be interesting to try. The stack temperature sensor in the Testo probe (upper chimney penetration) failed. A thermometer was inserted to allow manual stack temperatures to be taken. Gas curves. Solid red line is the estimated average stack temperature. CO was super low from 28 minutes to 80 minutes. This is in contrast to yesterday's burn, which recorded the highest CO on record at Lopez Labs. in quite high CO from 100 minutes to 140 minutes. As much fuel was added as the firebox would take. The last piece of 30 lbs was only added at 120 minutes. This contributed to good oxygen numbers, and very high efficiency. The buildup of charcoal at the bottom was a problem. Efficiency, at 84%, is at the theoretical limit, due to the very low stack temperature. The tailout portion of the burn was not included in the efficiency calculation. However, there is insufficient draft -- the bell heat exchanger is too effective (too large for the firebox size). PM was not measured, and the PM number shown is a dummy number for calculation purposes. Hairline crack has completely closed on the cold heater. a lifting action at mid-height, in the center 2/3 only. the results in average of a recent test run. every 2 minutes. That's why it shows as a fluent line. labs' and no spikes at all. which should be capable of burning soft wood in a very efficient way. The plan is to have a larger scale prototype ready in September. I'll send more data when I have it. Last month I've spent some time in order to fine-tune the rocket/bell. Mainly to be able to get it started without heating up the stack with a torch. So far it's going remarkably well. I've prepared graphics of four test runs, to illustrate the results. I've filled in the Condar spreadsheet as well. The fourth run, which was the dirtiest had also the lowest flue temp and is therefore the best with efficiency. Note the similarities in the graphics, mainly in the CO line. There is always a small bump in the beginning, then a fairly extensive valley and a bigger bump at the end. The differences in O2 and stack temp are caused by fiddling with the air intake. In particular, the ratio between under air, front air and side air. The hotter the thing gets the more the emphasis will be on the side air. The fourth graph do show a sharp peak of carbon monoxide in the startup phase with an oxygen level less than 5%. In this particulair case the side-air intake wasn't large enough. As a result, the siphon couldn't get sufficient air while the temperature was high enough. The interval of the graph is 5 minutes, while the peak actually lasted much shorter, something in the order of 2 minutes. It went down really as sharp as it went up. The conclusion seems to be: the oxygen level has to stay above 5%. When it's getting lower the likelihood of significant CO peaks are higher. This fact do limit the maximum efficiency. Two factors play a role in here: the amount of air that need to be heated and the temperature that's discharged through the chimney. It seems to be better that the oxygen is higher than 5%, and during the top of the burn at least 140 degrees Fahrenheit to the chimney is needed. This results in a maximum yield of 97%, according to the Testo equipment. Some more and the fire behavior is getting unpredictable. Above each graph are the averages of that combustion run. Based on the graphs it's clear that it is not needed necessarily to have a low CO level in order to achieve high efficiencies. Of course, the quality of the combustion is better at a low CO level. After a cold start with outside temperatures below 50 F., a lot of water vapor's escaping the chimney which simply do resolve within five feet. Lighting the thing is always the same: stacking the wood to the edge of the siphon and on top of that a small fire of which the flames instantly disappearing into the siphon. In that way, it warms up quickly with an average value of 900 F. in 12 minutes. Opening the door at the height of the burn is not a good idea. As the siphon is lower than the top of the door, part of the smoke will come into the room. At the moment I have no recent graphs of a testrun which has had a refill. This do provide a complete show with generally very low numbers of CO and O2. All the wood burns simultaneously, but large jumps in the different values remain absent. The thing will make a lot of noise, a kind of dull roar. The oxygen will go lower than the limit of 5% in about half of the instances. Without the major peaks in the carbon monoxide readings. The dangerous point is thus mainly during the cold start, as the side aeration and the syphon are not hot enough yet. The mantle of the experimental model will be quite hot after a refill. 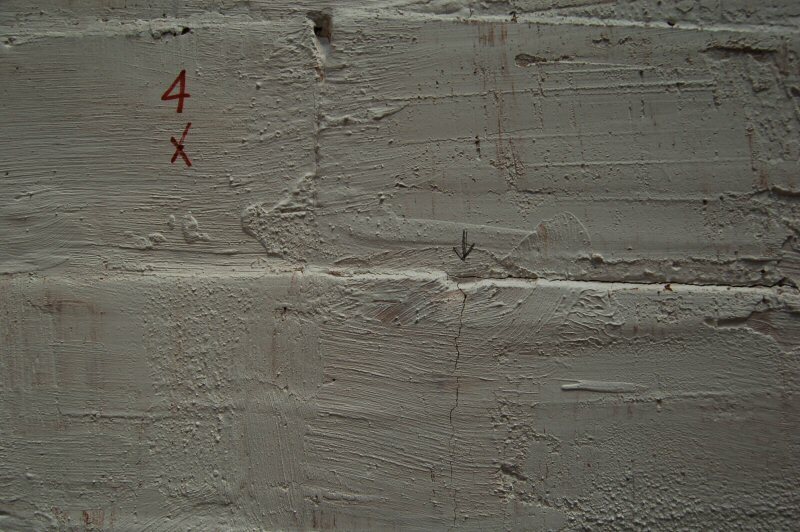 The double walled side, in total 5 1/4" refractory castable, has reached 230 F. at one occasion. At the front, about 4" above the steel door frame 275 F. during the same run. During such sessions the syphon will exit between 1560 and 1790 degrees Fahrenheit inside the stove. What the temperature at the hottest spot will be I don't know, I don't have a sensor in there. That would also be futile, the sensors I'm using cannot bear more than 1830 degrees F.
This article is translated from Dutch by google translate, like Eric Moshier suggested. I sincerely do hope it has become readable English after extensive editing by me.